Vanilla Ice is one of Zambeza’s best-selling Indicas and truly a remarkable strain. It was created by crossing genetics of Northern Lights XL, Skunk, and Afghani. The autoflowering version is simply a crossing between the feminized version of Vanilla Ice, and Ruderalis. Growers will just need to compromise a little bit on THC levels, but will get the fastest turnover of frosted Indica nuggets imaginable, in return. The most beautiful growing trait of Vanilla Ice is the insane production of resin and crystals during flowering. It will give the whole plant a magnificent appearance and buds really look like as if they would have been frosted. It doesn’t take much time to get there. Vanilla Ice Autoflowering completes its short life cycle in 55-65 days after seeds haven been germinated. It’s not a small strain, with typical indoor heights of 60-90cm, and yields of 300-350g/m². 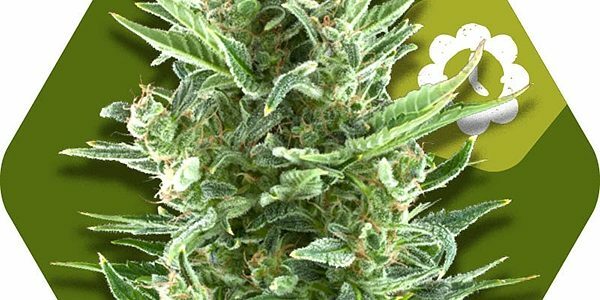 Outdoor growers with a sunny spot can count on 100-175g per plant. It might grow a little taller outdoors but heights of 1m won’t be exceeded. THC levels might be moderate with 13% but this doesn’t mean that Vanilla Ice produces a weak smoke. In fact, the opposite might be the case. Expect a taste of sugary sweetness, finished by amazingly refreshing aromas of vanilla. The high can be described as deeply relaxing and calming, so smokers will get very, very stoned. It might induce a laughing fit in situations where its not appropriate to laugh, so beware! This strain is highly recommendable for growers who appreciate frosted nuggets and a short life cycle. Flavours will bring tears of joy to the eyes of Indica- and Hash lovers, just like the feminized version of Vanilla Ice. It’s a tough one to decide between the two versions of Vanilla Ice because they both perform excellent. Choose wisely and create a winter wonderland!